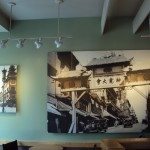 There is a very small Starbucks store on Grant Avenue in San Francisco, located very close to San Francisco’s gate to Chinatown. This store at 359 Grant Avenue does not have a Clover. It is not a drive-thru. It is not a Reserve Starbucks. (The Reserve line of coffees began in August 2010, with the first offering being from the Galapagos Islands.) It is not a newer-designed store. It is not LEED Certified. 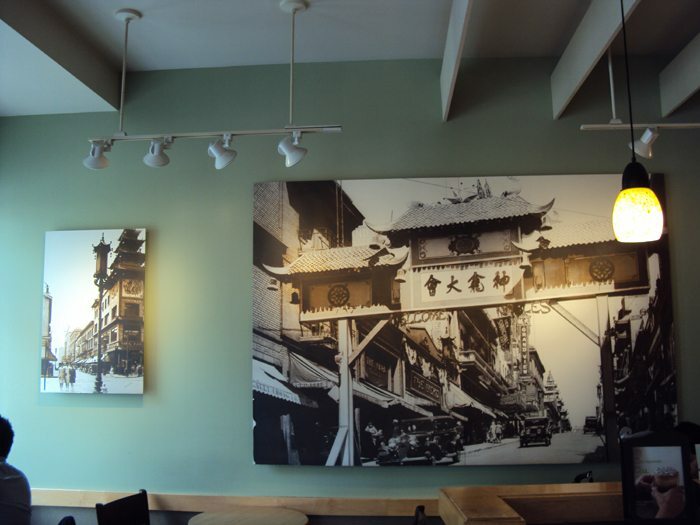 It’s just an ordinary, normal Starbucks. There is very limited seating with just a few hard tables and chairs. It feels like it might be only three hundred square feet, at most. Yet to me, this is a very special Starbucks. When I walked into this store on Wednesday the 16th of March, I felt like I was going to cry. 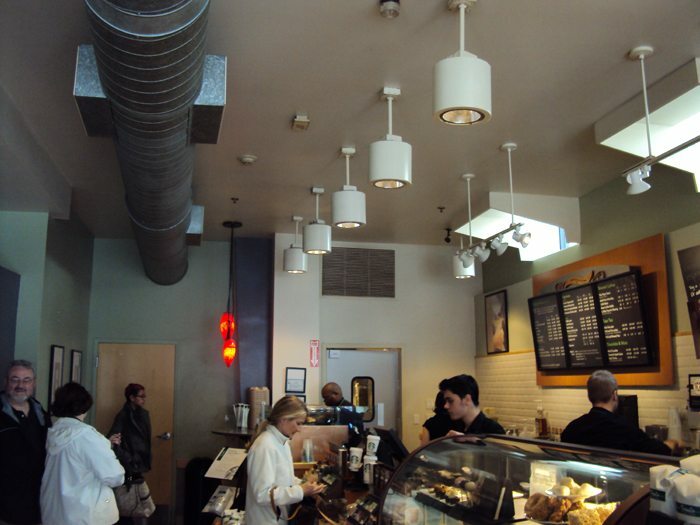 This is the Starbucks that helped get me through law school. I remember clearly being parked at their tables, sitting for hours and hours, surrounded by tall stacks of books, pens, highlighters, and a laptop. I am quite thankful that I was never asked to give up my seat due to nursing a drink for hours, sitting with books. Thank you Starbucks. 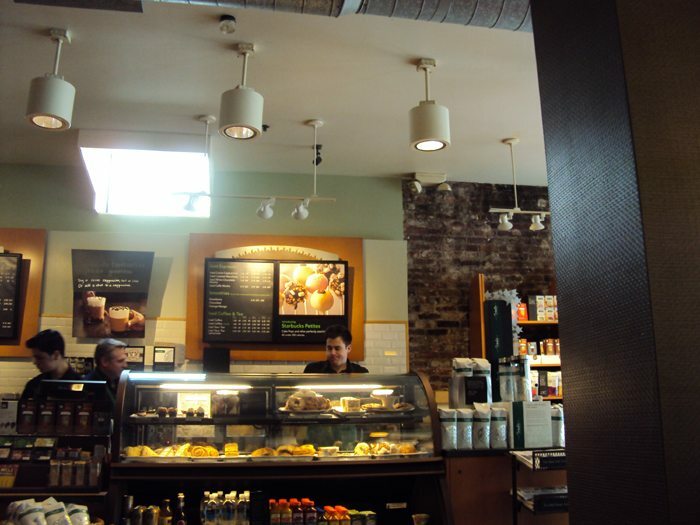 This very Starbucks is the place where my romance with the corporation began to be re-kindled. 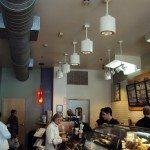 In the 1990s, I went through a period of being dismayed at Starbucks when I realized that beans starting to come in flavorlock bags, and that there was no “whole bean register” anymore, and I realized that Venti size had been added to the menu. 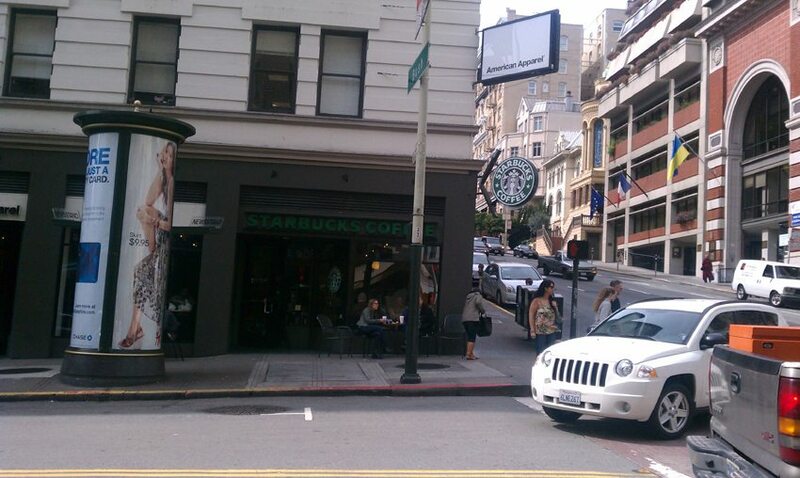 I started to recognize that Starbucks experience again when I lived in San Francisco. 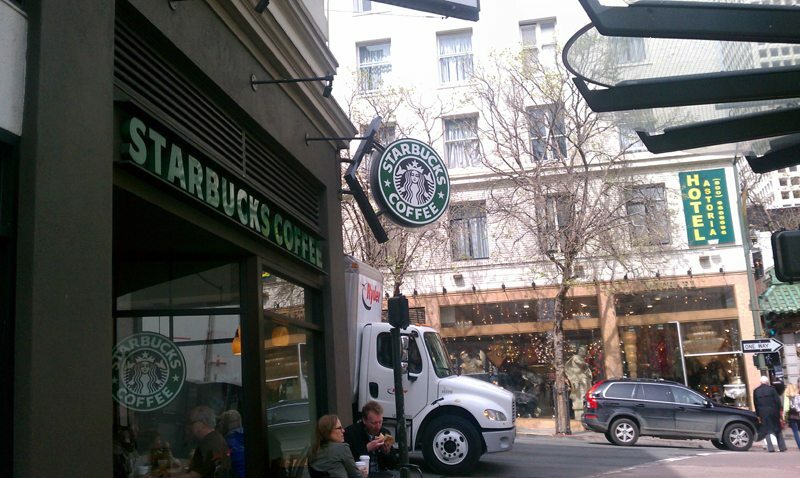 And when I saw a Starbucks in San Francisco, I felt like it was a bit of my piece of Seattle existing in San Francisco. It was a reassuring feeling. One reason I liked this store is that the people watching from this store is amazing. 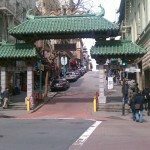 I am completely convinced that you could stare all day at the San Francisco Chinatown gate and what you would see is a non-stop parade of people getting their photos taken in front of the Chinatown gate. It is amazing how it is one, right after another, for hours and hours. The store’s clientele tends to be heavily tourists in the area, and often it’s a store where you’ll hear a few foreign languages spoken. On my visit, I met the store manager who happened to be there. His name is Donald Wallis. This was not really a planned visit to this store, but I wanted to see it again. The store was busy the entire time I was there. Although by amazing coincidence, the store manager had just made a press of Tribute Blend, and was sampling it to customers at the register. The store manager appeared genuinely enthusiastic about Tribute Blend. And here are a few photos from this store visit. I took the photos and visited the store on March 16, 2011. 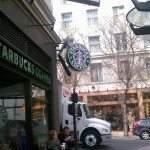 If you like reading about Starbucks in San Francisco, I also wrote about a store on Union Street. If you generally like reading about stores across the United States that I’ve visited, there is a category of them here. I love this store!!! Sounds like your experience with it during law school shows off the optimum SB experience. How terrific. The SM sounds like he likes his job and interacts with the community. Thank you so much for this review. This store is also very special to me…this was one of the first (or perhaps the first) Starbucks that I visited in SF on my first visit many years ago and I always enjoyed coming back. 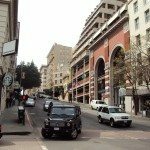 The last two years I went to a local language school on Bush street to improve my English and every noon I went to this store as well and enjoyed a Frappuccino. The partners are veeeery nice there…they remembered me during my two trips since 2009 (the German Starbucks fan, who always comes in a Starbucks shirt…HaHa!) and we had some nice conversations about the differences btw. German and U.S. Starbucks. A very special moment to me that i always remember: last year during my stay, I went to this store directly after having arrived at SFO from Germany. One female partner recognized me and she delighted me with 3 (!!!!!) Vivannos for free. I bought tons of VIA coffee there as well on this day. This was just awesome. I always remember it. This store is special…to me as well. I think it is so neat that the partners remembered you Sebastian and gave you such a nice welcome arriving from the airport. This is truly outstanding customer service. Oh yes it is…:D I was really surprised. That’s a great story! I’m glad you got to go back to your old Starbucks! It’s crazy the memories you forget that you still have that just pop right back up when you walk into a place you haven’t been in years. @Sebastian – That’s a great story. This IS a fine little Starbucks. The store manager was totally nice when I met him, though it did seem like he already knew my blog! Thank you for passing out the blog cards. 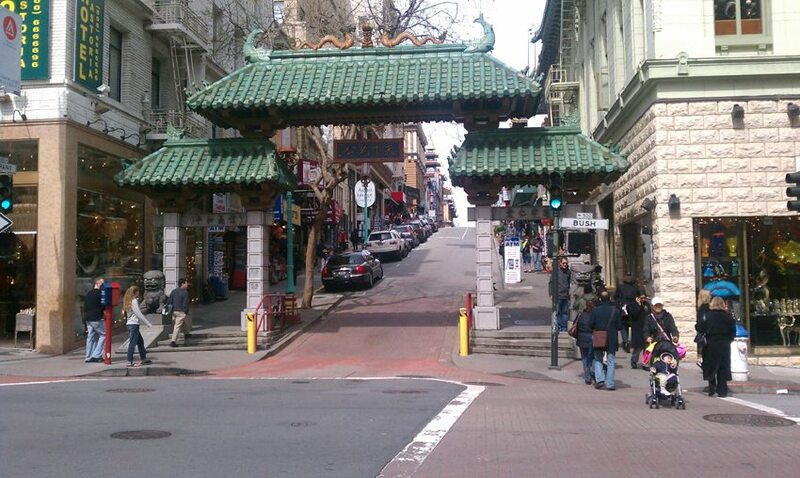 That’s a great corner in San Francisco. It’s in the middle of so much going on. By the way, I remember eating at the French cafe across the street too, way back when. Delicious! 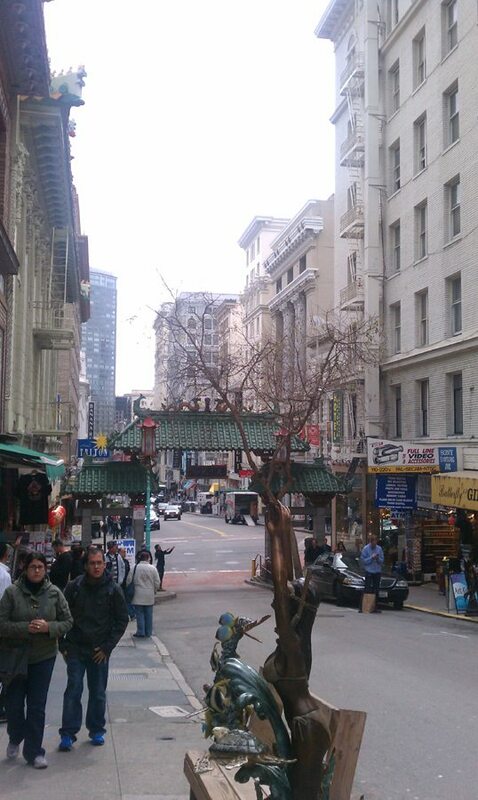 What an experience San Francisco was for law school! That is my second most favorite city in the world. @Sebastian – wow those partners have good memories! What a great store and story Melody……the store is great in its ‘ordinariness’, and of course your memories. It’s also the store where I got the “Christmas” baseball cap…… ‘it’s a wonderful store’. Like the store you have here, it’s a small and ordinary place and just filled with goodness. One of the ‘mistakes’, to me, in many ‘older’ stores is they had these seats at a bar facing across the front or a long window, whatever. For some reason, with a rare exception like this Central St store, they took them all out. Always seemed crazy to me…in many stores they could have left them in and still added the ‘big comfy’ stuff, when they felt they needed to. In one store I know of, they actually took out a few (3 I think) little tables with 2 chairs each, which were kind of squeezed in around the end of the bar but along the window side, and put in one of these old type high chair bars but it FACES behind the bar! 🙁 They put up a big piece of frosted plastic, to minimize staring at the ‘behind-the-bar area. It’s just a crazy place to sit. You gotta wonder who thinks of some of these things. ha. Anyway, that’s where this store you wrote about took me! I have come to the conclusion that it does not matter the size of the SB store nor if they have Reserve, a clover machine, etc. but the partners in there, the customer service and the community. 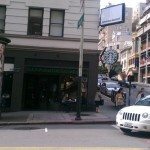 I have not stayed at SB stores where the partners are rude and the customer service is poor. Also, it would be nice if HS stopped at the stores and truly interacted with partners and customers. Words are nice, but actions mean more and SB needs to show that customers are important in action. >>I have come to the conclusion that it does not matter the size of the SB store nor if they have Reserve, a clover machine, etc. but the partners in there, the customer service and the community. Thank you Karl for agreeing with the statement. I would also hope that HS agrees with the statement and wants each SB to have every customer walk out of a store feeling happy. He has an opportunity with this new book to do some new training and create motivation that might have been lost. This store is such a good example of how people feel about their SB stores from the stories told here. So nice to read. Thanks again Melody for sharing. they still have the wrought-iron menu boards??? OMG, haven’t seen a pair of those in YEARS! @purple1 & @Karldotcom – Couldnt agree more. This store is a great example of a store making lots of great memories for people, without the heavily-celebrated ‘extras’ like an Olive Way Starbucks. I love Sebastian’s comments in this thread too! What great experiences at this store. Starbucks was certainly my beacon of hope in a world of law school despair…I agree that it’s the people that make or break the experience. Starbucks was a great “Third Place” for me when I went to law school. A place to study without the stress of the library we a blessing. These days, I’m quite far removed from law school, but a friendly experience at a favorite Starbucks brings back the same good thoughts. 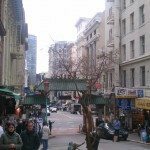 BTW, I too noticed the old wrought iron signage. Those are few and far between these days. Great story! 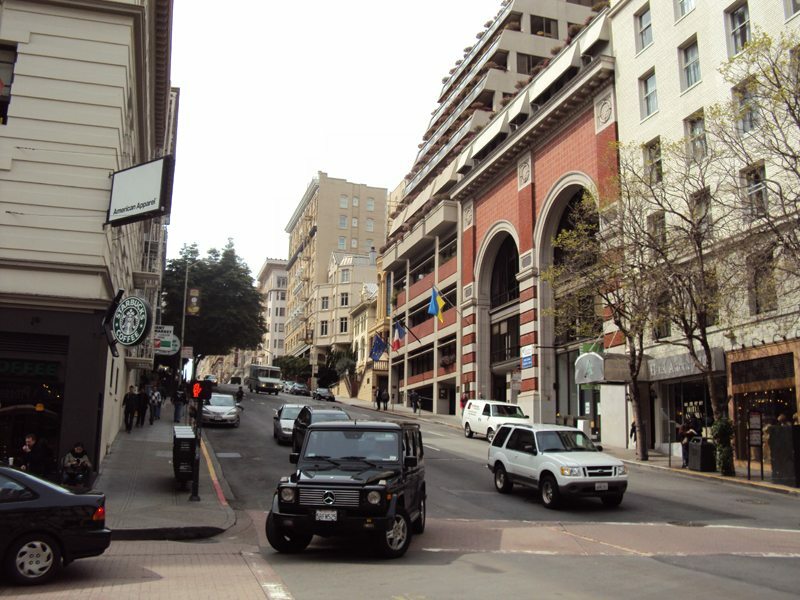 It’s been years since I’ve been to San Francisco – thanks for the review! I’ve never written notes like this, but I thought maybe someone in authority will read it and correct it. 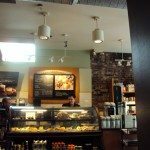 They have a very nice Manager at the Starbucks store at(359 Grant Ave. San Francisco CAlif.) but he is not always there. I like the Protein box but in order to eat the hard boiled egg in it, I need a fork. Again this morning (probably for the last several weeks) they don’t have any forks. Isn’t there a way that the store could alert a central supply dept when they are running low? I imagine there are enough Starbucks stores in San Francisco that the truck could be alerted when a store is low on something and then it would be replaced before it runs out.